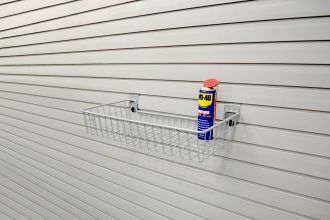 Suspend large items off your garage floor. 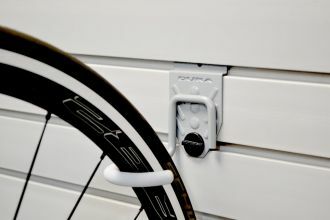 Bikes, hover-mowers etc. 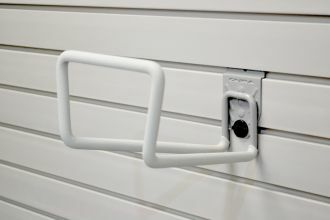 StorePanel installation is easy with basic DIY skills. 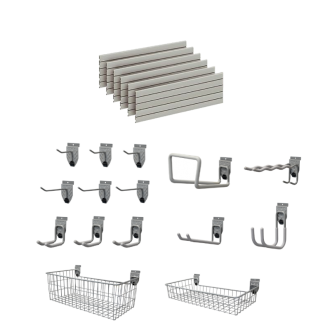 Heavy duty, decorative and durable slatwall panels with a range of hooks and baskets. 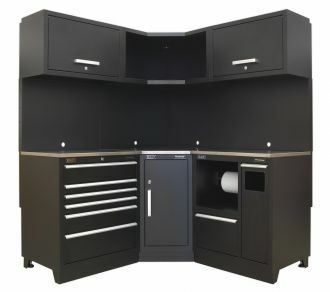 Our garage wall storage system provides three convenient sizes of kits for your garage, allowing you to store many garden and garage items off the floor tidily, safely and readily accessible for use. 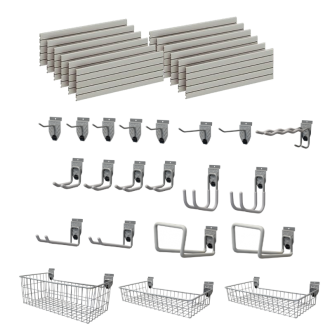 Twist lock hook and basket accessories ensure that they are secured to panels and cannot fall off or slide. 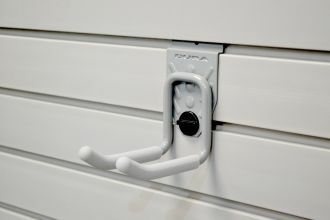 These are heavy duty panels designed for long term use in garages. 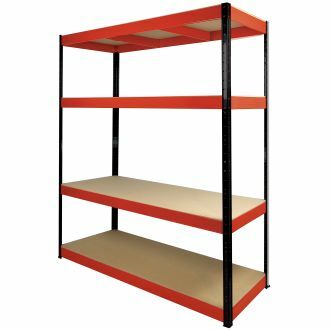 They are not adapted from similar but light duty products as used widely in retail. 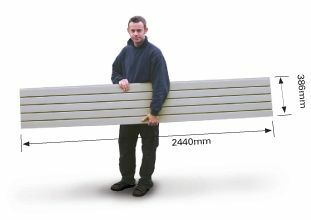 A pre-prepared kit of 12x4ft heavy duty panels to cover an area of 5.6m² with 21 accessories. 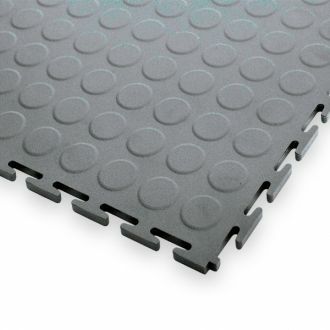 A pre-prepared kit of 20x4ft or 10x8ft heavy duty panels to cover an area of 9.4m² with 28 accessories. 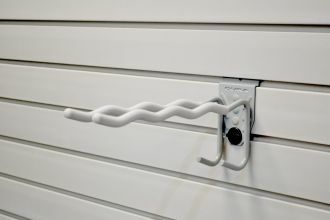 Support a range of heavy items that would normally clutter up the garage floor. 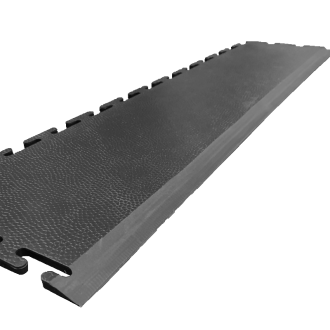 Supports several gardening tools at the same time to save space. 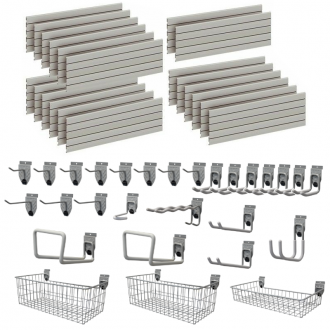 For heavier garden power tools, lawn mowers, ladders etc. 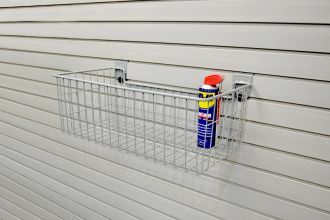 Many uses for the support of miscellaneous items. 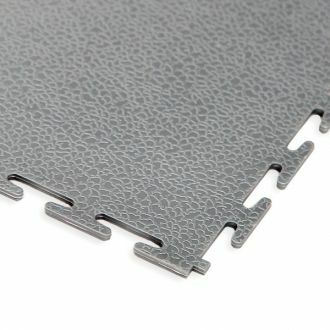 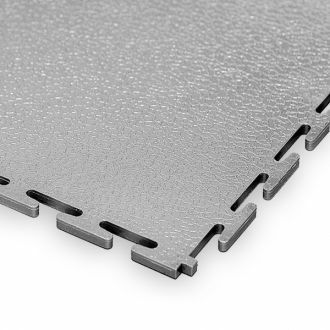 Individual heavy duty StorePanel™ panels 1.22 metres (4ft) long. 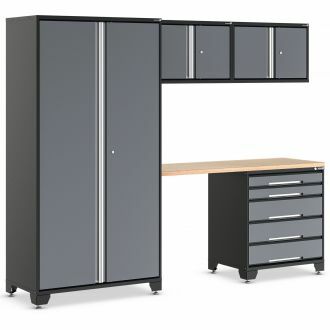 Height 0.386m. 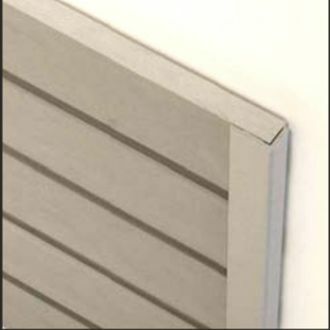 (8ft panels as pictured are available by telephone order due to higher delivery cost). 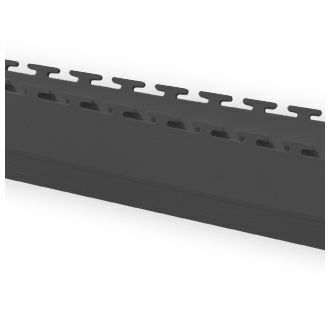 Each heavy duty plastic wall panel measures 2440mm x 386mm x 16mm deep and can be easily fitted to any studded garage wall surface or masonry using the Install Strips. 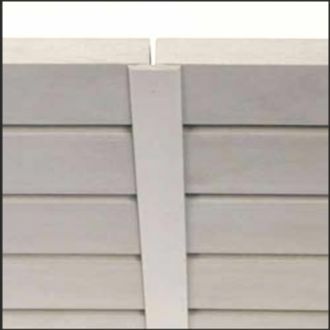 The panels are moulded from a thermoplastic material that is waterproof and resistant to mould and mildew. 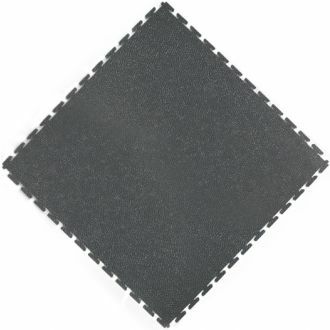 As such the colour is not just surface deep and so they stay looking attractive year after year. 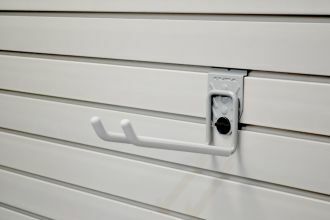 Using the Install Strips, StorePanel distributes the panel load to many points across the wall eliminating individual points of high stress when the panels are loaded. 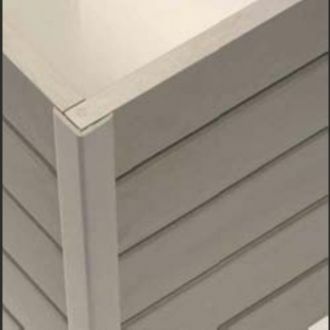 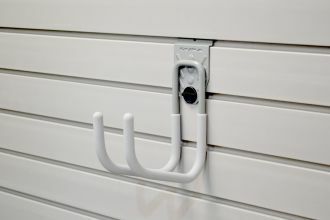 Whilst not necessarily required, the Install Strips simplify the installation procedure, they provide superior security and versatility and enhance the appearance of the end result with no unsightly screw heads visible. 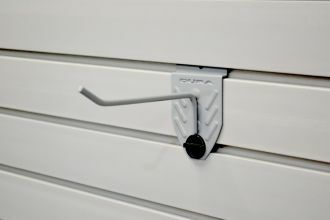 The strips can be fixed to any surface that you will find in a conventional garage. 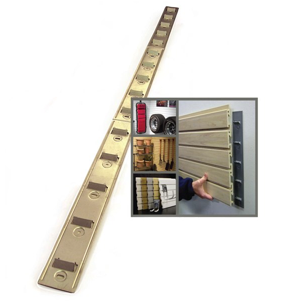 If required, the panels can be cut to length using standard wood working tools. 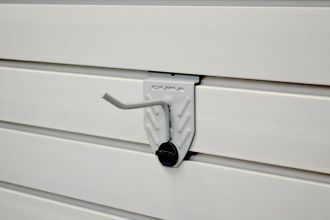 Colour-matched trim strips are available to finish off panel ends, and to hide the gap between adjoining panels, ensuring a truly attractive finish to your garage wall storage.